Welcome to The Field Trip and Enrichment Guide, compiled by Hooray for Family! Whether you are a teacher planning a school field trip, a scout leader organizing an outing, a PTA president designing a fundraiser, or a parent searching for a weekend adventure – don't look any further! 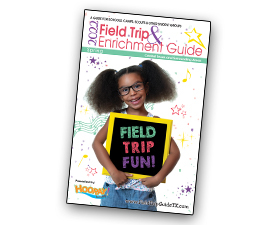 The Field Trip & Enrichment Guide is an annual, comprehensive, full-color, resource guide. The Guide is loaded with creative ideas to enhance classroom learning, build fundraising and enhance special days. It is filled with educational programs, destinations, experts, services, fundraising programs, cultural arts and more for those who plan the enrichment programs and field trip for our youth groups. Printed on glossy, high-quality paper stock, our full-color digest is the perfect size to keep handy and is visually appealing. Online readers of our digital flipbook will find the same high resolution ad with embedded links to your website. Your business is also displayed with your own page on our website. If you offer any of the following opportunities, Field Trip & Enrichment Guide is a perfect fit for you!